Real. Authentic. Wholesome. | Matrix Biolage R.A.W. The week is over! I'll admit that I don't exactly love summer (I don't love hot weather) but I am quite excited about the unofficial kick-off of summer. There is just something about the first long weekend and the occurrence of sun (even if I tend to avoid it.) That said, there is still one last post to get to before my weekend can truly start, so let's get to it. I've been testing A LOT of hair products lately (it's a rough job, but someone has to do it...) but have been stuck on one range when it comes to my cleansing/conditioning needs: Matrix Biolage R.A.W. With more and more people looking for naturally based products, Matrix is filling out the hair care sector with their take on cleaner options. 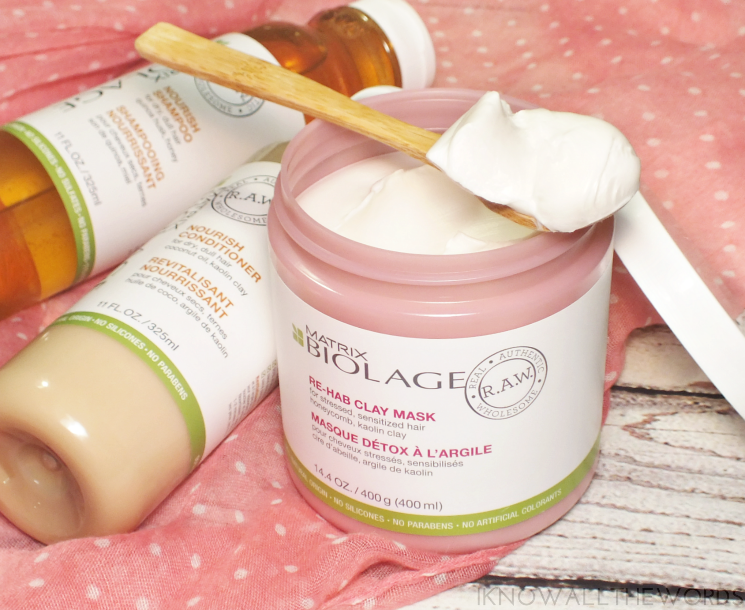 The Biolage R.A.W. (Real. Authentic. Wholesome.) range includes 70-100% natural origin ingredients and aims to 'feel-good, look-good, and do-good' for both your hair and the environment. The products definitely tick the look good box; I mean how cute are the juice-like bottles? If you were wondering, natural origin is what matrix considers an ingredient to be if it is 'unchanged from its natural state or has undergone processing yet still retains greater than 50% of its molecular structure from the original plant or mineral state.' For a complete rundown on the ingredients in the range and how they work, I recommend this handy chart. it's actually quite interesting. 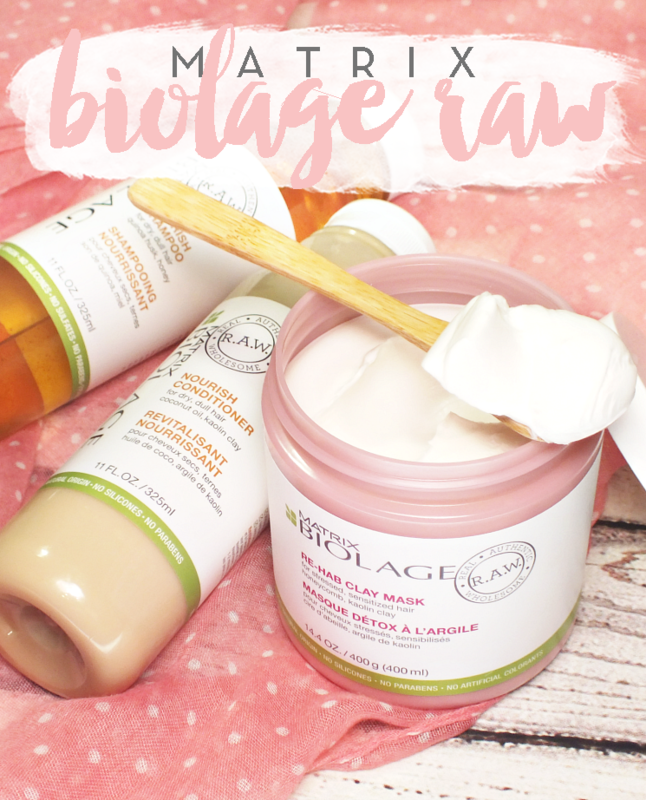 The Biolage R.A.W. range of products includes three product families- Nourish (for dry, dull hair), Recover (for stressed hair) and Uplift (for flat, fine hair)- of which I've been using the Nourish Shampoo & Conditioner. The shampoo is 77% natural origin, is 99% biodegradable with no sulphates, silicones, parabens, or artificial colourants. It features a blend of quinoa husk and honey to replenish moisture in dull, dry hair. I found it quite interesting that the shampoo has a very runny texture that almost feels sticky prior to lathering. It doesn't effect the shampooing process, but is totally unique to anything I've ever used. The matching Nourish conditioner boasts 95% natural origin along with all of the other impressive stats of the shampoo. It utilizes coconut oil and kaolin clay to revive dry-dull hair and leave it remarkably soft without feeling weighed down. My hair is fairly thick, but the hair itself is fine, so I can tell from the first use if a conditioner is too much for my hair. This conditioner feels quite lightweight when applied but really does feed hair and leaves it feeling so much softer and visibly hydrated. For extra special TLC, I've also been using the Re-Hab Clay Mask from the Recover range. The clay mask uses a blend of honeycomb, kaolin clay, goji berry, and coriander oil to deeply condition stressed, sensitized hair while rebuilding strength. I don't care for the herbal scent of this mask, but I looove the effect! For a mask that only requires five minutes on hair to process, it completely revives hair. 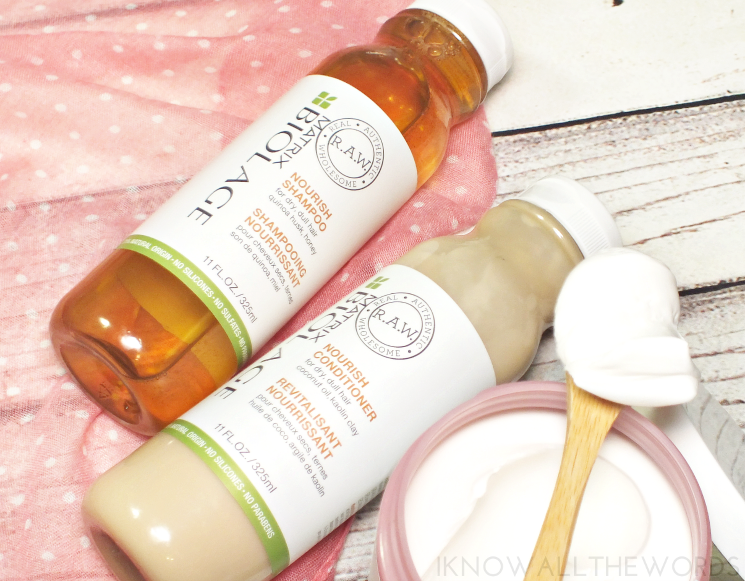 I try and only bleach my hair twice a year, so I haven't used this post belaching yet, but I imagine this will work beautifully to revive dryness and keep damaged hair manageable. The rich texture is also surprisingly easy to rinse out of hair, so it gets bonus points from me. So, this got pretty long, but what can I say? I'm a complete fan of these products! It's not always easy finding a great colour-safe shampoo, but Matrix has really done it with this range. I only wish the bottles were bigger. What do you think? Could this be your next shampoo and conditioner duo?